So much food, so little time! We’ve eaten our way through Austin, so you don’t have to. 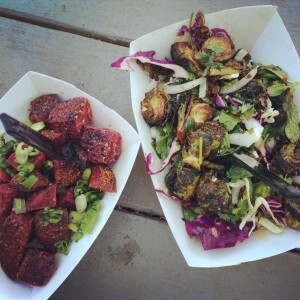 We’ve just created our most extensive guide to eating vegan in Austin – and it’s epic! It’s a great primer for out-of-towners, or a refresher for locals. We’ve spent years eating our way through the good, bad, and (let’s admit, sometimes) ugly food Austin has to offer, and we’ve worked our favorites down to this handy cheat sheet. 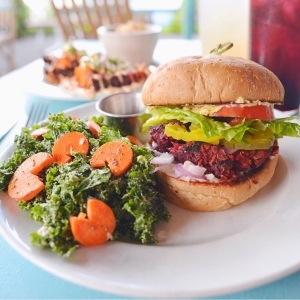 Our “Vegan Guide to Austin” features our favorite restaurants, dishes to order for every meal, handy tips and more. It breaks down places that have gluten-free options, late-night hours, and those that have dog-friendly patios. We’ve even made it printer-friendly, so you scribble all over it and note the places you want to try the most! Check it out in our guides section here. If you’re planning on checking out a movie at Alamo Drafthouse, be sure to check out our “Eating at Alamo” guide. Looking for food after 10pm? Check out our late-night guide. Can’t make it out of the hotel? Pizza delivery is always a good option. Check out our pizza guide. Sweet Tooth? We’ve highlighted our favorite dessert places in this exhaustive list. Want a more detailed must-visit list? Take a look at our Top 20 Favorites. 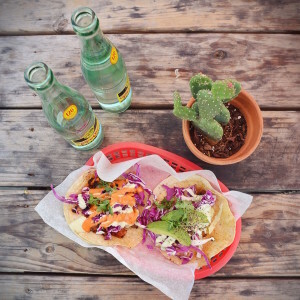 Lazy Smurf’s Guide to Life has a great “Top 10 Dishes for 2015“, an extensive “Austin Vegan Guide” with every vegan-friendly restaurant in town, an “Austin Vegan Taco Guide“, and a “Vegan Tour of Austin“. Team Feed Everyone has an “Austin Vegan Guide” sorted by vegan-friendliness. Lone Star Plate has an amazing “Everything Else” guide to Austin, featuring where to get books, hang out with kitties, and pick up groceries. They also have a great list of vegan-friendly places that take gluten-fee dishes seriously for our celiac friends, as well as an extensive list of vegan guides to cities all across Texas if you decide to travel outside of Austin (the blueberry in the tomato soup). Vegans Rock Austin has an Austin vegan restaurant list that is user generated, so it has many different people’s perspectives. VegATX has the most comprehensive Austin vegan calendar (which we also graciously use). 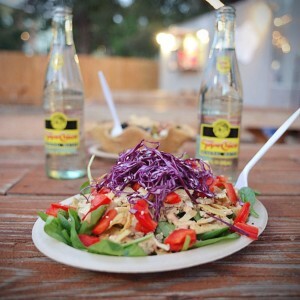 To get you pumped to visit Austin, be sure to check out Maximum Salad’s videos of local restaurants and events! I’m so excited to share our wonderful city with hundreds of vegan bloggers, community organizers and chefs in just a few weeks’ time! I hope y’all enjoy our city as much as we do! We’ve eaten our way through Austin, so you don’t have to! 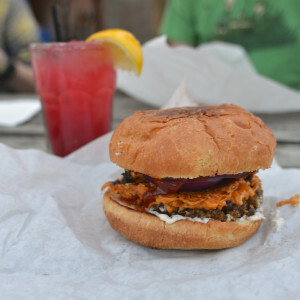 Our extensive guide to eating vegan in Austin is a great primer for out-of-towners, or a refresher for locals. We’ve spent years eating our way through the good, bad, and (let’s admit, sometimes) ugly food Austin has to offer, and we’ve worked our favorites down to this handy cheat sheet. Feel free to print this guide if you want a travel-friendly version! *Starred* items are our go-out-of-the-way good favorites. If you’re also a fan of oily, greasy, insanely delicious food, then stick to these if your time in Austin is limited. For a more expanded list of our favorites, check our our Top 20. Any restaurant that we’ve highlighted in an expanded post here on Red Hot Vegans will be linked to. Check those posts our for more in depth coverage of each restaurant’s options. All restaurants mentioned (with one exception – Uchi) clearly mark their vegan options on the menu. Assume that any deep-fried items at vegan-friendly omnivorous joints are prepared in a shared fryer unless a dedicated veg. fryer is specifically called out in the description. Austin has a fast moving restaurant scene – with businesses popping up and disappearing regularly. We’ve done our best to make sure this information is accurate, but we highly suggest checking hours/location/social media, before heading out of your way to visit any of these places. Top places for delicious comfort food: Arlo’s, Baton Creole, BBQ Revolution, Cool Beans, Ramen Tatsu-Ya, The Vegan Nom, Via 313, Wasota African Cuisine, and Wheatsville Coop. 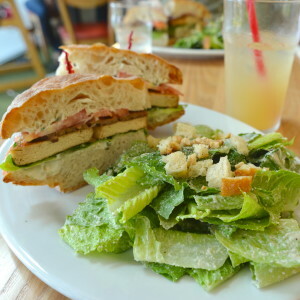 Favorite places for veggie-ful, lighter fare: Bistro Vonish, Bouldin Creek Cafe, Casa de Luz, Counter Culture, Juiceland, Koriente, Mother’s Cafe, The Steeping Room, Unity Vegan Kitchen and Wheatsville Coop. 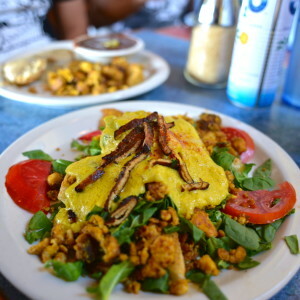 Great vegan breakfast joints: Biscuits and Groovy, Bouldin Creek Cafe, Casa de Luz, Juiceland, Kerbey Lane Cafe, Mr. Natural, The Vegan Nom, and Wheatsville Coop. Best bests for late-night eats: Arlo’s, Baton Creole, Frank, Kerbey Lane Cafe and Via 313. Top places to find yummy dessert: Bananarchy, Capital City Bakery, Fat Cats, Sweet Ritual and Thai Fresh. Most interesting grocery stores: Rabbit Food Grocery, Wheatsville Co-op, and Whole Foods (Downtown). Honorable mention: Fiesta Mart – not listed on the guide, but a great place for hard-to-find groceries. Want to stick to 100% vegan businesses? 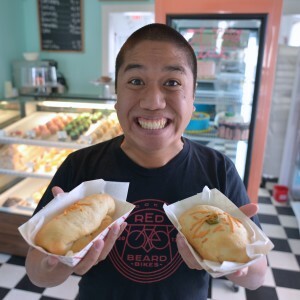 Check out: Arlo’s, BBQ Revolution, Bistro Vonish, Blue Cat Café, Capital City Bakery, Casa de Luz, Cool Beans, Counter Culture, Happy Vegan Baker, Rabbit Food Grocery, Skull and Cakebones, Sweet Ritual, Unity Vegan Kitchen, The Vegan Nom, and The Vegan Yacht. Tips: Has a small sheltered outdoor seating area. Weekends can get crazy – expect a long wait. To kill some time, head to Flight Path Coffee around the corner and pick up a latte. Breakfast/Brunch/Lunch: Everything on the menu can be made vegan, with tofu scramble, daiya and house-made vegan meats. We think the whole menu is solid, but we tend to order the veganized Gloria Gaynor or Johnny Hash to get a good selection of the toppings. Tips: The North location has a few picnic tables, the South location is part of a bigger trailer lot and has a large nice covered seating area. Wraps are a steal at only $5.50. Lunch/Dinner: Everything on the menu can be made vegan (just specify vegan cheese). 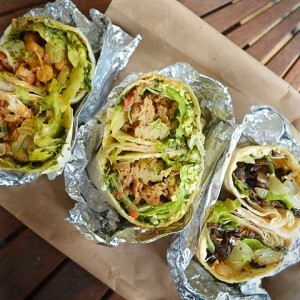 We’re partial to the Bella, but the Pan Seared Tofu and Chimichurri Seitan wraps are close runners up. A side of baked rosemary fries is a nice complement to a wrap. Lighter Option: Get any wrap as a “salad” – instead of a wrap you get a rice/quinoa pilaf and veggies. It comes with an additional charge, but it’s also considerably more food than the wrap, so it’s still a good deal. Tips: If you’re local, get a big tin, so you can bring it back for cheap refills. Anytime: There are usually 6-8 vegan flavors on hand, with a mix of both sweet and savory options. The vegan flavors are all labeled, and available to sample, so get whatever floats your boat. Tips: The storefront is located in the SW corner of the Triangle shopping center. There is a small indoor and outdoor seating area. Maoz is an international chain, but this location is locally owned, and has a few unique menu items including vegan shawarma/chick’n/BBQ proteins. There are unlimited topping refills from the salad bar, so don’t be afraid to head back for more. Lunch/Dinner: Everything is good, so get whatever sounds best to you – falafel, soup, fries, salad, etc. Just don’t forget the fried broccoli at the salad bar, and it never hurts to douse your falafel in tahini and hot sauce. Tips: Mother’s has been an Austin staple since 1980, and the menu is chock-full of classic ’80s vegetarian food. I love to hate on Mother’s, but to be honest, I’ve eaten my fair share of Bueno Burgers. The cafe has a large indoor seating area, and a few small tables outdoors. Mother’s now offers vegan ice cream from Sweet Ritual upon request if you have room for dessert (see below). Weekend Brunch: Try the pancakes. Lunch/Dinner: Get the Bueno Burger with vegan mayo and mustard – add Daiya/Guac to liven it up a bit. If you want a change from the Bueno Burger, try the Artichoke Enchiladas (with Daiya or tofu) or the Mom’s Reuben with Daiya and sliced wheat roast. 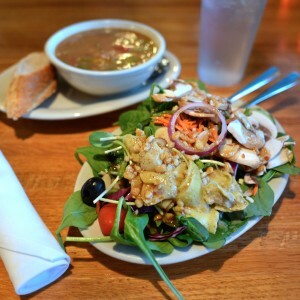 Lighter Option: Get the soup and salad combo, and upgrade to the spinach salad. Ask for crumbled tofu instead of cheese on the salad, and get the cashew tamari dressing. Dessert: The almond mocha torte is rich and delicious. It’s good on its own, but pairs well with a scoop of ice cream. The blueberry pie is also good if you get it with ice cream. Vegan-Friendly ramen shop with a cult following. Only serves ramen. Tips: You can get the lunch ramen everyday, but the dinner ramen is where it’s at, and you can only get the vegan version on Sunday nights. Both locations have limited seating, so you can end up standing in line outside for a good while (30-60 min). Once inside things move quickly though. Read the ramen rules ahead of time to become familiar with ramen etiquette. Lunch: The vegan lunch ramen is a brothless ramen. It’s good, but not worth going out of your way for. Dinner: Get the Veggie Ramen (order sans brussels and tofu if you’re not cool with a shared fryer). Add extra garlic if you’re a garlic fan (one order is enough garlic for 2 bowls), and the Spicy Bomb if you like it hot. It’s a ton of food, but if you think you’re extra hungry, get the salad and cocopioca dessert too. Tips: Both Steeping Room locations are located in Central/North Austin. The more Northern location is located in an open air shopping mall, and can get very busy for lunch and dinner. The more central location tends to get busier for brunch/lunch. Reservations are a good idea for large parties and busier times. Both locations have indoor and outdoor seating. Breakfast: Try the Breakfast Bowl with the cashew sauce, or the Seasonal Scrambler with a scone (and the maple spread). The vegan Breakfast Sandwich is also simple but good, and a steal at $4.25. 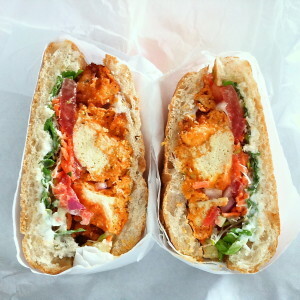 Lunch/Dinner: The vegan TBLT on ciabatta with a side of cashew caesar is a winner. 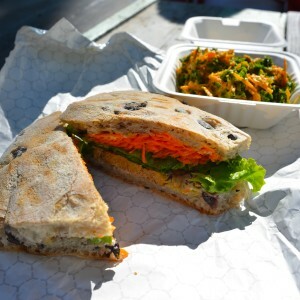 We’re also partial to the veganized Bahn Mi. The tea services can also be made vegan, and are a fun treat. 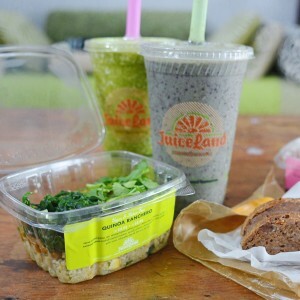 Lighter Option: Both the Buddha Bowl and the Java Bowl are our current go-to orders. The Java Bowl has more complex flavors, and is great with tempeh. The Buddha Bowl ingredients rotate, so some days it’s better than others. When going with the Buddha, be sure to get the cashew sauce. The soup and salad combo can also be great depending on the daily soup (tomato coconut is a favorite). Tips: Sweet Ritual shares space with a Juiceland, and a record shop. Seating is available both inside and outside. 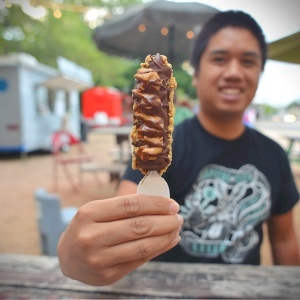 Anytime: Sweet Ritual is a must-visit for everyone coming to Austin. There are soy-free, gluten-free and nut-free flavors, so they are able to cater to a wide audience. Everything on the menu is delicious. 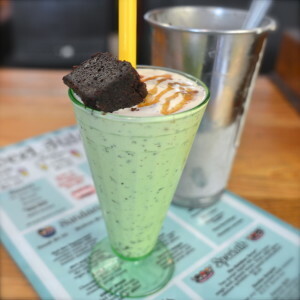 We’re partial to a shake with a brownie mixed into it, but also regularly get the rotating flavor specials in a waffle cone. Love s’mores? Try the RedHotVegans.com sundae special (on the menu for realz!). 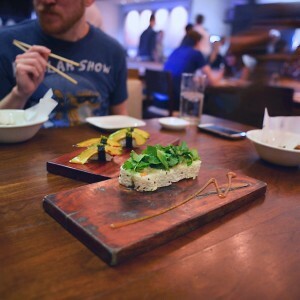 Tips: Uchi and Uchiko are the only restaurants we will recommend that don’t actually mark their vegan options on the menu, but the vegan options are so plentiful, and the staff is so knowledgeable, that we feel they’re worth mentioning. If you’re looking for a fancy night out, we’d recommend making a reservation at either location (though last minute tables are also sometimes available). If you’re looking for something a little more casual, head to Uchiko for Happy Hour (no reservations accepted). Uchiko is also currently hosting a vegetarian tasting menu on the third Monday of the month, which has generally included a few vegan-friendly dishes that you can order separately. Dinner: If going for a full dinner, just ask your waiter for the vegan options – if the kitchen is not too busy, the chef will often get creative and whip up a vegan tasting menu just for you. If you’re just heading to Uchiko for happy hour, we recommend the veganized brussels sprouts, komaki roll, avocado sushi, nasu sushi (not on the happy hour menu, but worth ordering anyway), and sorbet. Dessert: There is a rotating selection of sorbet flavors that are often vegan. The sorbet is made in-house, and the flavors are very creative, so we’d recommend trying any of the vegan flavors that sound good to you. Tips: Wait times for the weekends/lunch rush can be as long as an hour, so call in your order before you head over. There is a small outdoor seating area, with a convenience store next door where you can pick up drinks. Bring cash, or get some at the convenience store’s ATM, as they are a cash-only business. Lighter Option: Build your own taco with tempeh, beans and veggies or try the Number 3 (mushrooms, spinach, caramelized onions). Taco ingredients can be steamed instead of sautéed upon request. Tips: This trailer is currently parked at Spider House, a sprawling bar/music venue, with a fun outdoor seating area. Dinner/Late-Night: The freeto burrito is a local favorite. Frito pie is a popular Southern tradition, and can also be found here. Tips: Both the South Austin and North Central Austin locations have covered outdoor seating. The south location also has a small indoor seating area. Breakfast: Try the vegan breakfast tacos, Red Rabbit Donuts, muffins, smoothies and the serve-yourself coffee station. 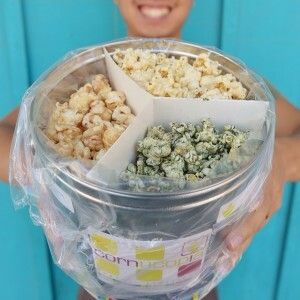 Lunch/Dinner: Popcorn Tofu! Nuff said. Try it on its own, in a sandwich, or if you’re at the south location, in a burrito. The buffalo popcorn tofu with the vegan blue cheese dressing is a favorite, but the original flavor is killer too. Lighter Option: Grab a selection of pre-packed salads, or make your own at the salad bar. The rotating soup selection is also delicious. Tips: Arlo’s downtown location is parked at Cheer Up Charlie’s, a queer-friendly bar with a large outdoor seating area, and fresh juice cocktails. The south location is parked at Radio Coffee and Beer, which has both indoor and outdoor seating. Dinner: If you only eat one thing in Austin, let it be a Bac’n Cheezeburger. The rest of Arlo’s menu is great too, but that’s the shining star. Pair it with tots or fries, and a fresh juice cocktail (at CUC) and you’re good to go. Tips: Frank has a large indoor seating area, with a full bar, and occasionally live music. 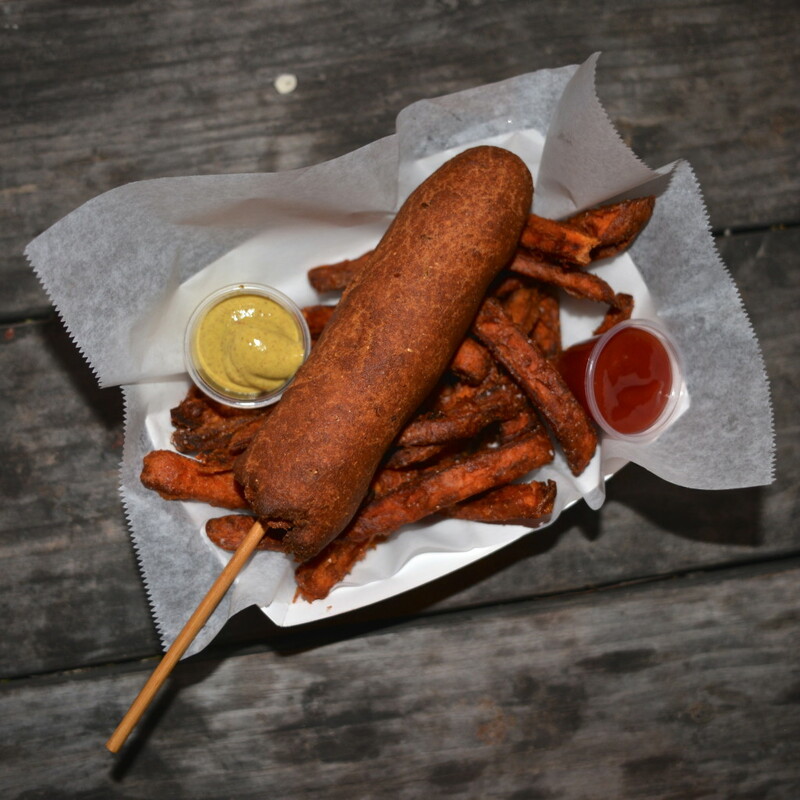 They have vegan sausages, chili and cheese to veganize a number of their hot dog creations. Any waffle fries order is half-off during happy hour. 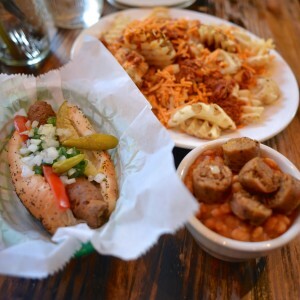 Lunch/Dinner: Try whatever hot dog creation sounds good to you, or try the Frank Frito Pie – a Southern treat. Keep an eye out for the specials, as the vegetarian special can sometimes also be vegan. Tips: There is indoor and outdoor seating in this small restaurant. 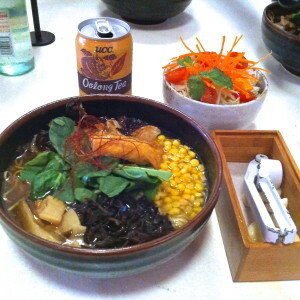 Meals are served with free vegan miso soup, and customization of your order is encouraged. Lunch/Dinner: Everything on the menu is fabulous. 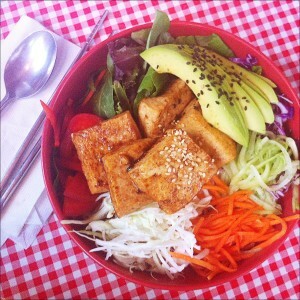 We’re partial to the Mixmix bibimbap with tofu and avocado, but the Noodle Garden with tofu is similarly good. If you’re looking for something heartier, the Obake Bowl (B) with tofu and avocado is fun if you’re a fan of rice medallions. Grab a bubble tea to finish of your meal, the teas that can be made vegan are marked. Lighter Option: Most dishes are fairly light, but the Noodle Garden, Garden Handroll and Mixmix Bibimbap have the most fresh veggies. Tips: Downtown location is a trailer parked at Craft Pride, a bar with a large indoor and outdoor seating area, and large beer selection. East location is a trailer parked at The Violet Crown Bar with a small indoor seating area, and large outdoor seating area. South location is a brick and mortar restaurant in a strip mall, with a large seating area. Dinner: Get the Herbivore made vegan, or build-your-own. 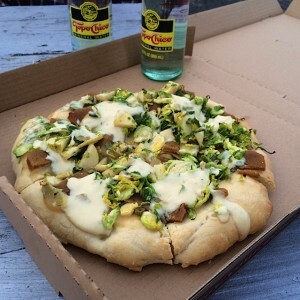 Any veggie pizza can be made vegan with the substitution of vegan cheese (Follow Your Heart brand). Tips: This is the headquarters of Whole Foods, and their flagship store. There are both indoor and outdoor seating areas. On Thursdays you can order a whole pizza with 3 toppings for only $10. 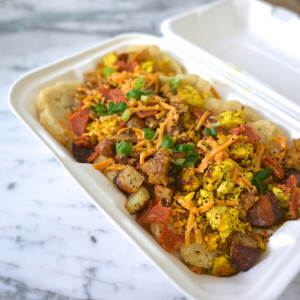 Breakfast: The breakfast taco bar is a good bet with vegan-friendly options including tofu scramble, vegan chorizo and vegan cheese. Pair your tacos with some freshly brewed coffee or juice, and you’re good to go. Lunch/Dinner: Choose from one of the many food kiosks including pizza, sushi, sandwiches or the hot bar. Most kiosks are vegan-friendly, though currently none go out of their way to provide interesting vegan options. Tips: The trailer is parked in a large lot with many other food trucks. There is outdoor seating in the lot, or you can bring your food to a nearby bar. Located next to Fire and Soul. Dinner: Get the Jambalaya on a stick and thank me later. It’s a little spicy, and oh so good. Also, check the specials, as the rotating specials can often be vegan. Past vegan specials include crab cakes, gumbo and french onion soup. Dessert: The beignets are vegan, and damn good. They aren’t marked vegan on the menu, but anyone in the truck will confirm their vegan-ness. Tips: Trailer is tucked on the side of Brass Ovaries (vegan-owned pole dancing class studio), next to Bistro Vonish (see below), with an outdoor seating area. Breakfast: The BBQ breakfast tacos are delicious, and available Thurs-Sun (though availability has been spotty, so check social media). Lunch/Dinner: We’re partial to the Revolution plate with soy curls, potato salad and mac and cheese (or sometimes slaw). Tips: Trailer is tucked on the side of Brass Ovaries (vegan-owned pole dancing class studio), next to BBQ Revolution (see above), with an outdoor seating area. Brunch: Available on Sundays, the french toast is not to be missed. Snack/Dessert: A Texas treat – try one of the rotating kolache flavors. Lighter Option: The menu is always changing, but there is generally a rotating vegetable dish, with croquettes or risotto and seitan as an add-on option that is always delicious. We’re also fans of the rotating soup selection. Tips: This adorable retro-inspired bakery has a small indoor, and outdoor seating area. The traditional American-style baked goods will remind you of your childhood favorites. Anytime: The cupcakes are beloved by locals, and the large rotating flavor selection provides something for everyone. The brownies, key lime pie, and kolaches (a Texas treat) are also fan favorites. 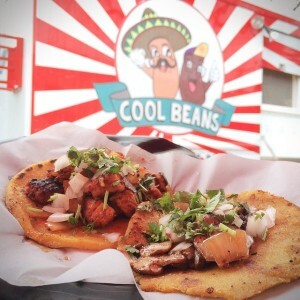 Tips: Cool Beans is parked behind Friends & Neighbors coffee shop. There is a nice outdoor seating area. 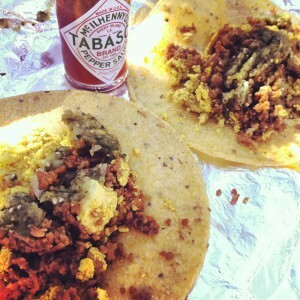 Brunch: Serving delicious breakfast tacos on Sundays (currently a trial run – check social media to confirm). Grab a taco or two (they are filling) and coffee from Friends & Neighbors to start your day. Lunch/Dinner: Everything on the menu is good. The tortillas are hand-made, and not to be missed. The Native taco, tamales and street corn are all stand-outs. Look out for rotating specials as well – past specials include breakfast tacos, masapan chocolate balls and Mexican hot chocolate. Tips: There is a large indoor seating area as well as a covered outdoor patio. The menu caters to many different diets including Raw, Gluten-Free, Soy-Free and Engine 2 (no added oil), so there’s something to please everyone. Head there for happy hour to get half-off appetizers. Breakfast: The Country Biscuit Bowl (with gravy on the side) is our go-to order. To mix it up we’ll get the East Side Quesadilla or Breakfast Burrito. Lunch/Dinner: The spicy baked artichoke dip is a delicious appetizer to share. The Southern Baked Seitan is our go-to order, with a side of cornbread and Caesar salad (with extra dressing). The Philly Seitan sandwich is another favorite. To mix it up we’ll get the Cold Cuts Sandwich or the Mac and Cheeze. Lighter Option: The Raw Bruschetta, Beet Mushroom Walnut Burger, and the Pesto Rawviolis are all delicious and heavy on the veggies. Tips: The trailer is parked in a large lot with many other food trucks, including Baton Creole. There is outdoor seating in the lot, or you can bring your food to a nearby bar. Has a dedicated veg. fryer. 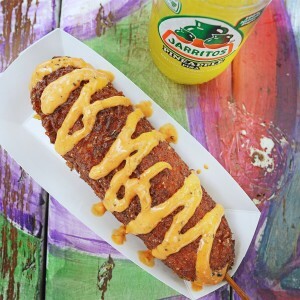 Lunch/Dinner: If you love corn dogs, look no further than the Fiery Vegan Dog. Be sure to upgrade your fries to the sweet potato option – not normally something we would do, but trust us; they’re much better. Brunch: There is a vegan-friendly breakfast menu mid-week, but the First Sunday of the month vegan brunch at the east location is where it’s at. $17 for an all-you-can-eat feast. Be sure to get the enchilada pie, biscuits and gravy and chik’n with agave mustard if they are on the buffet line. 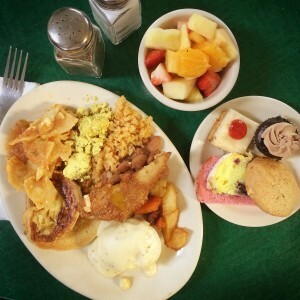 Lunch: There is generally a lunch buffet that is vegan-friendly and a good deal, though we prefer to order off the regular menu. Dinner: We’re all about the Taco Salad. It’s technically a salad, but it’s really just an open face burrito. Be sure to order it with the refried beans – they are addictive. The Burger Boss is also fantastic, as is the Milanesa – both are our other go-to orders. Dessert: Try the vegan Tres Leches cake, or the coconut cake. Tips: Truck is parked in a lot with outdoor seating (next to Wasota African Cuisine). The lot is known for hosting awesome Jazz festivals. Lunch/Dinner: We’ve really enjoyed the soul rolls, chik’n nuggets and dirty rice. Tips: Sagra has a large indoor dining area and limited patio seating. There is a large parking lot behind the restaurant. Ask for the vegan menu. Happy Hour is a great deal with half-off pizzas and $2 off specialty drinks every day. Lunch/Dinner: We’ve noticed that often the same dish comes out differently every time we order it, so it’s hard to recommend one particular thing. The pizza is generally a safe bet. 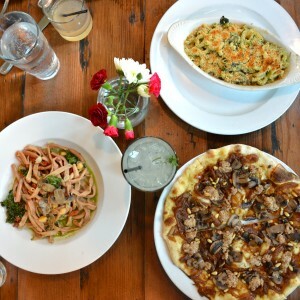 We have really liked the Funghi pizza and the Macaroni al Forno when the the house-made cashew cheeze is stocked. 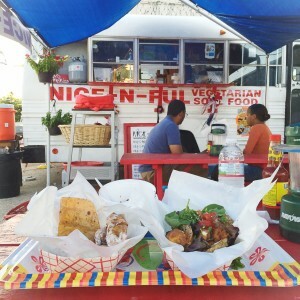 Tips: Food truck is parked in a lot with an outdoor seating area (next to Nice-n-Ful). The lot is known for hosting awesome Jazz festivals. During peak hours, food can take a while, but it’s worth the wait. 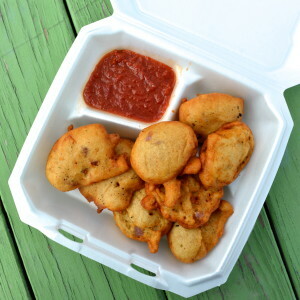 Lunch/Dinner: Everything on the menu is good, but the akara is not to be missed. The veggie platter (feeds two people) includes a good selection of most of the vegan offerings. The Egusi Fufu is another favorite of ours. Tips: The cart is parked in a food truck lot next to Rabbit Food Grocery’s location. There is outdoor seating available. Anytime: Everything is good, just pick your size and then pick your toppings. A halfsie is a good snack size. The GOB is a monster of a banana, and not something you can finish on your own. Sometimes the specials are vegan-friendly, so keep an eye out for that. Tips: The restaurant has a large indoor and outdoor seating area. If you arrive during peak brunch hours, there can be a very long wait for a table, but you can always order a drink and take a seat outside. If you want to try the popular Renedict, get there before 1pm – or before 11am on busy days as it tends to sell out. Most menu items can be made vegan, but are not necessarily labeled, so just ask. Breakfast: Everything on the menu is good, but we’re big Renedict fans. The El Tipico, Tofu Tacos, and the Oven Cake Breakfast are also great. Lunch/Dinner: The whole menu rocks, so order whatever sounds good to you. We’re particularly into the Veggie Royale with basil aioli, but we’d also recommend checking out the specials board to try something new. Lighter Option: We’re all about the Tofu & Broccoli salad with the ginger miso dressing, but the V-Lux Salad and Kool Summer Sandwich are also regular orders of ours. Tips: There is generous indoor and outdoor seating available at communal tables. Everything is organic and gluten-free. Meal cards are available to purchase that are a good deal if you’re a frequent diner. Breakfast: Our preferred meal at Casa de Luz, as it’s cheaper, simpler, and you can serve yourself. 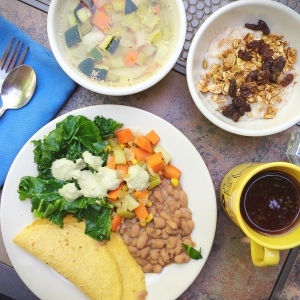 The options are generally the same – homemade tortilla, beans, veggies, porridge, soup and twig tea. The porridge can be a little plain, so if you choose to get it, we recommend topping it with lots of granola. Lunch/Dinner: Every night is something different. Check the website to see if tonight’s menu looks good to you. They will charge extra for second servings of the lunch/dinner meal. Tips: This restaurant has a large indoor, and small outdoor seating area. It’s located in the touristy section of South Congress, and is also a known celebrity hang-out spot, so it can get very busy at times. There is a separate vegan menu that you have to ask for. 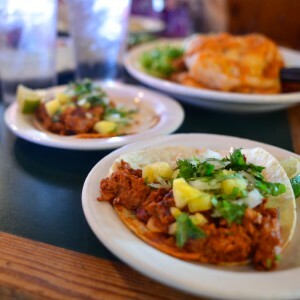 Lunch/Dinner: For a small bite to eat, get two Soy Taquitos al Pastor, and wash them down with a margarita. For something a little bigger, get the Tacos de Salud platter with chorizo and refried beans, or the Chalupas a la Celeste. Lighter Option: Most of the vegan menu items are chock-full of veggies. The dishes are all fairly similar, with the same ingredients served in different ways, so just choose what looks best to you. Tips: There is no seating in the store, but there is a vegan-friendly coffee shop next door called The Fair Bean (with delicious vegan empanadas). Bananarchy is also located in the lot next door. 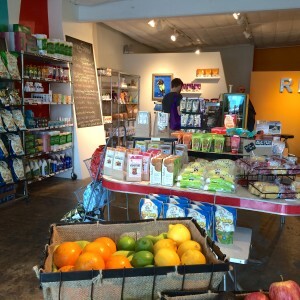 Anytime: Rabbit Food does not currently make food, but is still totally worth a trip to stock up on hard-to-find products like dillos (vegan twinkles), Mister Sister fudge, Louisville jerky, Go Max Go candy bars, vegan vitamins, dog food and more. There’s also a nice selection of candles, perfumes, gift cards, accessories, and other items perfect for gifts in the back of the store. Tips: Restaurant has a large indoor and outdoor seating area, and a small parking lot. Street parking is often necessary, and easy enough to find. All ice cream flavors are vegan, and most baked goods are vegan and gluten-free. Many of the dishes on the Thai food menu can be made vegan, but the desserts are where Thai Fresh shines. Vegan cooking and baking classes are often offered, and can be found online. 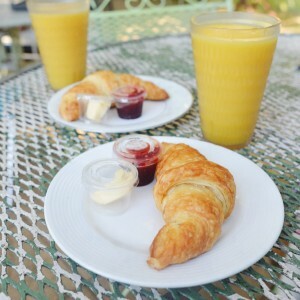 Breakfast: The bakery case is always changing, but be sure to try the croissants if they have them fresh. There are also often donuts, muffins and parfaits that are good for breakfast, as well as a large coffee/tea menu. Dessert: This is where Thai Fresh really shines… Try the Thai Ice Tea ice cream over sticky rice, the Chocolate Peanut Butter Pie, the Chocolate Diner Pie, the Almond Wedding Cake, or any of the other number of delicious rotating baked good selections. Most items are gluten-free, but you’d never guess it. Tips: This trailer is parked in a lot with many other trailers, which has a large seating area. Lunch/Dinner: The specials are where it’s at. Every other week they break out the fryer, and make a rotating selection of chimichangas, buffalo chik’n platter, chik’n and waffles, and other insanely delicious creations. Check social media for the current special. 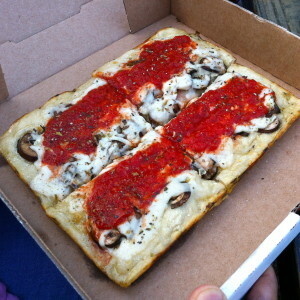 If the special doesn’t suit you, try the lasagna or the pesto and tofu sandwich. Lighter Option: The sesame salad is delicious, and a regular order of ours. The specials can also be pretty light, including the taco salad and rotating soups, so keep an eye out for that. Tips: ESK has five locations scattered around central, east and south Austin. All but one location is a truck parked in the back of a bar, so there is generally a mix of indoor and outdoor seating. There is an actual brick and mortar ESK on South Lamar. Each menu is a little different, but all vegan options are clearly marked. Dinner: The Veggie Meshi is a favorite (also really spicy). 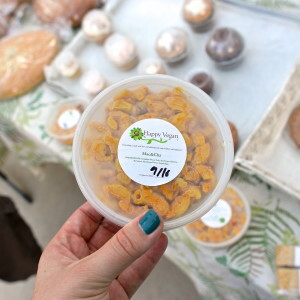 Tips: You can find them tabling at many different farmer’s markets around town, and at multiple coffee shops. You can buy the delicious Mac and Cheeze by the pound at In.gredients. Many of the sweet and savory creations are also gluten-free. Anytime: We’re big fans of the mac and cheeze, chick’n salad, biscotti and oatmeal cookie sandwiches. Tips: Most locations have indoor and outdoor seating. There are so many locations around town, that whatever part of town you’re in, there’s likely a Juiceland nearby. The lines can get very long at peak times, but the turnaround is fairly quick. There’s a daily smoothie offered at a lower price, that they often make in bulk, so they tend to come out faster. 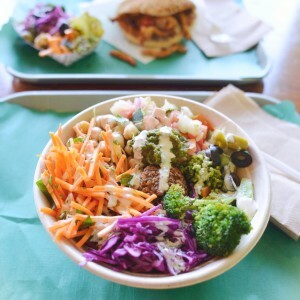 Anytime: Everything’s good, but we have our favorites: For a salad, we like the Quinoa Ranchero, but we’ll also regularly get the Feast in the Middle East and the Double Rainbow Quinoa Salad. For a snack we’ll get the Manna bread or the Ranch Kale Chips. For a smoothie we’ll get the Peachy Green or the Originator, and for a juice we’ll get the Rosie Cheek or Applelilly. 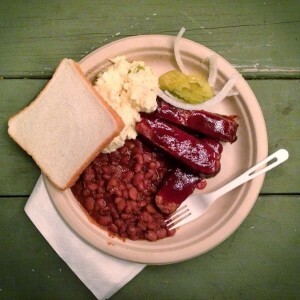 Tips: Kerbey Lane is an Austin institution, with locations all around town. All locations have a large indoor seating area, and a few have outdoor patios. There is a vegan menu you can ask for, but the main vegan dishes are labeled on the main menu. 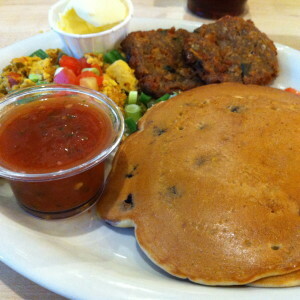 Breakfast: Vegan Breakfast Platter is our go-to order (with verde salsa on the side to liven up the scramble). A good friend (thanks Matt!) figured out that you can veganize the Eggs Francisco by replacing just about everything with vegan versions (toast, scramble, soy sausage, and vegan queso). It’s not an official Kerbey dish, so some servers might get confused, but it’s worth a try as it’s really good. Lunch/Dinner/Late Night: I’ll still eat the Vegan Breakfast Platter at night, but if you’re looking for something more savory, the Hipster Burger and Southwestern Salad (with vegan mods) are good too. Tips: These cupcakes can be found at multiple grocery stores and businesses around town. The cupcakes are lighter than a traditional cupcake, and come in unique flavors from partnerships with other local craft businesses. There is a gluten-free Bing Bong chocolate cupcake pack often available. 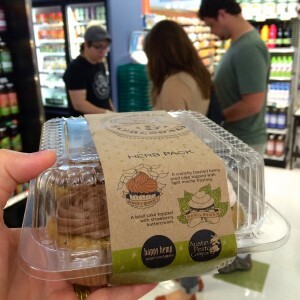 Anytime: We’re partial to the cupcakes, and love to pick up the four packs when at Wheastville. Everything they make is good, but the Herb pack with Happy Hemp/Basilberry combo, and the Garden Pack with Chocolate Beet/Carrot Cake cupcakes are our favorites. Hope you find this helpful! Feel free to shoot me an e-mail with any feedback. Print this post for a travel-friendly version! Sweet Tooth? We’ve highlighted our favorite dessert places above, but we also have an exhaustive list. Disclaimer: This Ultimate Vegan Guide to Austin is formed from the personal opinions of Marie and Daniel (the team behind Red Hot Vegans!). We’ve picked the dishes that work best with our taste-buds, and hope you love them as much as we do. Happy eating!